There’s nothing wrong with being ladylike or graceful. I like ladylike behavior. For example, you’ll never meet a bigger fan of Miss Manners than me! 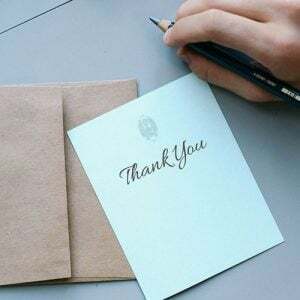 And I am a FANATIC for thank you notes. I admire graceful women and I think it would be SO freaking neat to be one! Oh, to glide across a room with grace & elegance! So what bugs me about the phrase? Is there anything wrong with being graceful? Of course not! But “going gray gracefully” as a concept still irks the crap out of me. The gray hair transition has brought up a LOT of feelings for me. It’s a deeply personal experience. So telling me how to do it “gracefully” seems like butting in! Going gray has made me think about things like my mortality. I have a son with some special needs. Who will take care of him when my husband and I are gone? The gray hair transition has made me think about women, culture, and society. Why is everyone so invested in controlling women’s behavior? It also has brought up questions about ageism, biology, and genetics… I’m not close to my biological paternal relatives (by choice), but it has made me wonder: Do they look like me? What else about them is similar? It makes me think about my Dad – he was technically my stepfather, but that’s such an inadequate word for what he was to me: my one and only beloved Daddy. He had beautiful salt & pepper hair. It was one of his defining features. I had dark hair, so when I was a little kid I positively glowed when people told me that I looked just like him. When I see my gray hair now, it makes me miss him even more. 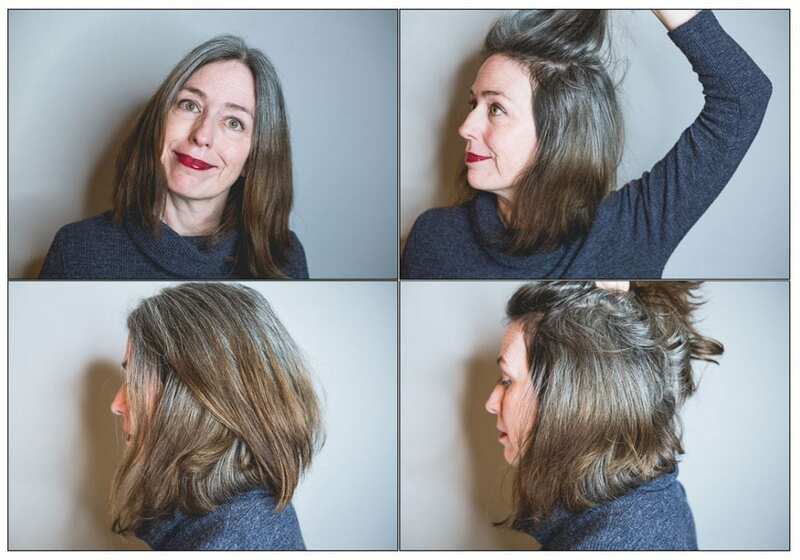 The gray hair transition also makes you think about identity. What does it mean to be a person on this planet? If I was this person before (young, brunette), who am I becoming? Will she be different than the current me, and the one I was before? If that’s the case, who am I, really? It has got me thinking about my perfectionistic tendencies. I used to go NUTS when I saw gray hair poking through. It made me a little OCD to see the white hair coming up in the middle of my expanse of dyed dark hair. Now that I’m going gray cold turkey, I’m forced to be kind of Zen and just “let it happen.” This goes against my natural tendenc to control things and that’s a GREAT THING! Katie at 10 1/2 Months Dye-Free – staring at my laptop but still feeling Zen! I’m a fast moving, fast talking person. Going gray cold turkey is forcing me to do something SLOWLY and to appreciate the process instead of rushing through it. OK, just a warning: this is where things get a little bit nuts! It’s making me think about prioritizing things I love to do instead of just duties and responsibilities. It’s making me think about how lucky I am to be alive, on Earth, at this moment, even with all the craziness going on in the world. Not everyone is lucky enough to be here, breathing the air, and listening to music, talking to people, petting dogs, and doing all the other mundane things we take for granted. I feel like trying to be graceful about it would undermine the freedom and happiness I’m experiencing during this process! So, I resolve to go gray MESSILY and JOYFULLY! 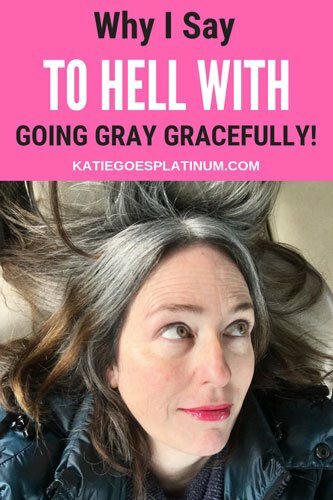 Which basically means, I’m going to go gray in the way that feels right to me: Imperfectly, rebelliously, and without giving a flying fig what anybody else things about it. I vow to ROCK my gray hair and ROCK the rest of my life! When I see my hair and that of my silver sisters, all I can think about is moonlight. That’s what it looks like, and I prefer the moon to the sun, so it’s perfect! And butterflies? Well, going gray slowly is like being a caterpillar slowly emerging from its cocoon as a beautiful butterfly. That’s how I’m feeling right now. What Not To Wear After… Age-Smage! Love your post. I do not want to cut all my hair off! I have no color for 7 months..lots of different colors, but my Aussie is a black tri and she is gorgeous! I can be a gray tri! I am loving going grey . Although I never dyed my hair but I was using henna instead which made my hair turn red and was awfully messy and smelly . Many a times my hair dresser tried to convince me to color my hair coz in India it’s still a very new concept of leaving hair uncoloured. My daughter and searches on Pinterest, going through all texts on going grey has made me more confident and happy . Thank you ! Thank you for writing this! My problem phrase is – “Gray hair don’t care”. I’m 44 and 6-months into my journey and of course I care! I care tons! Just because I choose not to dye my hair anymore doesn’t mean I don’t care. I’m lovingly caring for my new, awesome salt and pepper hair everyday. That one just drives me nuts! Thanks again for your post, I loved it. Monica, so glad you loved it! I can see how that phrase would also be irritating. Who would NOT care about getting gray hair? I would think it would always feel like a big surprise! Katie, love your journey and your mission. Going “natural” as Emmy said has been an amazing and affirming journey for me. I have only received support and positive comments. But then I only have positive and supportive people in my life. My silver hair has actually encouraged a number of women in my life to join my going natural movement. And I have never ever received so many compliments on my hair as I do now. This journey has been fantastic! I’m so glad you are having a great time with your journey, JoAnna! Me, too! It’s transformative! I’ve toyed with going grey for years, and have chickened, out back to coloring each time. I’m turning 60 in June and it’s on my mind again, I’m also sick of hair salons — the sinks are literally a pain in the neck! Time to go long & grey? Hopefully! Thank you thank you. Finally a kindred spirit. 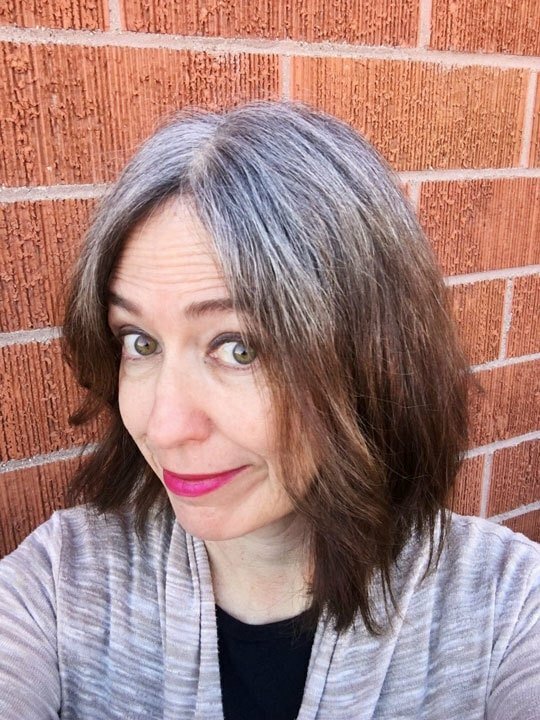 I just turned 50 and decided to go Grey. I’m actually very excited after I read your blog. Hi, Dee! I’m so glad! Make sure to join Silver Revolution on Facebook if you want to keep the excitement going. It’s a great, supportive group. I don’t like words like ‘lady-like’ and ‘gracefully’ because of all the gender stereotyping and policing of femininity that comes with it. 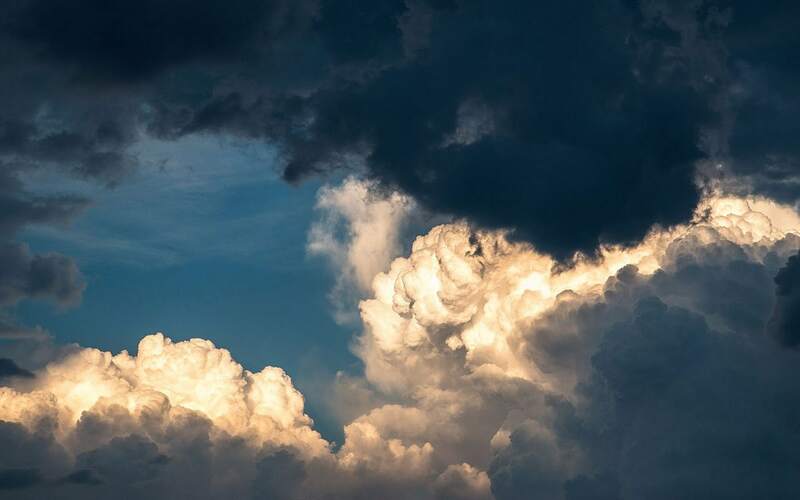 I love your reasons why you will not try to include being graceful into the process, but I’d kinda like to be free of that norm forevermore, and only attempt grace if I so choose! By the way, maybe I’m weird but I actually really like the look of the strong contrast between colour and grey – so much so that I’d be tempted to colour just to create that affect again. 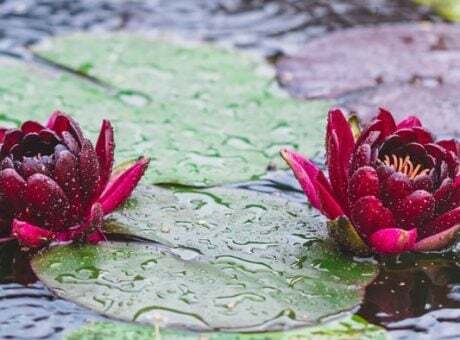 We’ve been brain-washed into thinking roots must be concealed, but if you look at it without those assumptions, it’s actually a really interesting affect. Thanks for helping to normalise this entirely normal and shameless process. You’re welcome! I don’t think you’re weird for liking the contrast between strong color and gray – I like it, too! Sometimes I think I might get the ends of my hair dipped when I’m all gray to recreate it. This made me smile. I transitioned with the help of my stylist, adding more highlights to blend the transition line. At 10 months I completely lost patience and asked her to cut off the “old hair”. I giggled every time I looked in the mirror. I was shocked how much I looked like my mother. Now that my hair is “real” AKA grey and curly, I find myself smiling at my reflection, more and more. Smiling at your reflection is ALWAYS a good thing, right? I love it, Susan! I think you are doing a fabulous job both with the silver ride and your words to express your process. I’m much older than you and decided a long time ago to quit dying and frosting and just enjoy my hair. I have two sisters younger then me both completely silver. Mine has changed a lot in the last year but I’m still more salt and pepper than silver. I’m really enjoying your blog. Hi, Peggy: I’m so glad you’re enjoying it. Thanks for letting me know! The phrase “going gray” generally bothers me. At 53 years old I say that I am “going natural”. It’s been almost a year since I last colored my hair. The stylist I had for 20 years was surprisingly not supportive so I went it alone for about 5 months but the brassiness of my colored hair was too much. I found a stylist who has helped control the brassiness with toner, leaving my new growth untouched. It was the right thing for me to do. It is a very personal decision to stop coloring your hair, but I find it empowering and am anxious to see what the final result will be. I have slow growing hair and expect it may be another nine to twelve months before I am totally natural. It will be worth the wait! Thanks for sharing your story! Hi, Emmy! That’s great that you were able to find a supportive stylist! I’m glad you also find this process empowering. I had no idea when I started this how transformative it would be! Hi, Grace – Yes, please do!